New Delhi : This weekend on NewsX, English news channel, brings to its audience an interesting discussion between Shri. Biplab Kumar Deb, Chief Minister, Tripura and Ms. Sheela Bhatt on the show No Holds Barred, during his discussion, Sh. Biplab Kumar Deb talk about, how his statements on “Internet in the Mahabharata era” and “questioning the rationale behind crowning Diana Hayden Miss World” were taken out of context and how he is being misjudged on several occasions, he also spoke on the developmental plans for Tripura. In another show, NEWSX-TSG Roundtable and Cover Story, watch out for a one-hour special on the topic, The Contenders: Who will lead India, in this weekend episode,watch out for an interesting conversation between Sh.Sachin Pilot, PCC Chief Rajasthan, Sh.Akhilesh Yadav, President, Samajvadi party; Sh.Omar Abdullah, Former Chief Minister, J&K; Sh.Ram Madhav, National General Secretary, BJP and Sh.Jayant Chaudhary, Vice President, RLD; the show was hosted by Ms. Priya Sehgal. The weekend episode of Legally Speaking will capturethe rules, regulations and laws regarding the use of drones in India. In the episode on Policy and Politics,this week’s guestSh. Anil Swaroop, Coal Secretary will talk about success of UDAY, achieving 1 Billion tonnes of coal production and how will he replicate the Gujarat model of electricity reforms in other states. Ms Sheela Bhatt, National Political Affairs Editor, NewsX will interview the guest Shri. Biplab Kumar Deb, Chief Minister, Tripura on No Holds Barred and will discuss on the topic of Development plans for Tripura and Sh. Biplab Dev’s controversial statements. The episode will be aired Saturday, 10th November @ 10:00 pm and Sunday, 11th November @ 7:30 pm. 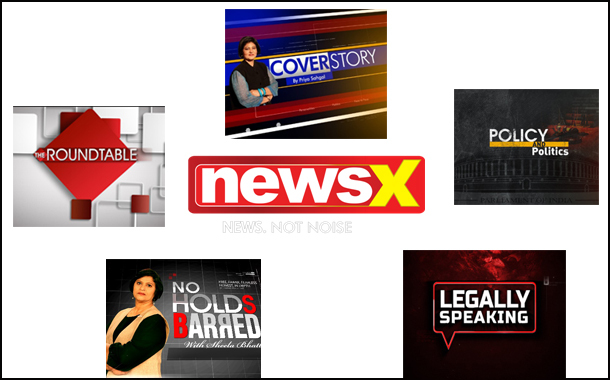 NEWSX- TSG Roundtable and Cover Story: The Contenders: Who Will Lead India– One Hour Special anchored by Ms Priya Sahgal, Senior Executive Editor, NewsX will feature guests like Sh.Sachin Pilot, PCC Chief Rajasthan, Sh. Akhilesh Yadav, President, Samajvadi party; Sh. Omar Abdullah, Former Chief Minister, J&K; Sh. Ram Madhav, National General Secretary, BJP and Sh. Jayant Chaudhary, Vice President, RLD and will discuss on the topic The Contenders: Who Will Lead India which will telecast on Saturday, 10th November @ 5:30 pm and Sunday, 11th November @ 2.30 pm & 8:30 pm. On Saturday, 10th November @ 10:30 pm and Sunday, 11th November @ 12:30 pm the channel will air Legally Speaking with Adv. Khushbu Jain and CPR, Ananth Padmanabhan as guest anchored by Mr. Tarun Nangia, Associate Editor- Special Projects NewsX and will discuss on Rules & Regulations and laws related to use of Drone. Policy and Politics will air on Sunday, 11th November @ 10:30 am with Sh. Anil Swaroop, Coal Secretary as guest anchored by Tarun Nangia, Associate Editor- Special Projects NewsX and will discuss on the Success of Uday and Replicating Gujarat model in other states.